This is where Ann gets lost in her creations. There will be many hours spent here, and you can put a bet on some of them being frustrating, but all will of them will be cherished. You can see Ann has the basics for silversmith work, working with copper and a number of other materials. 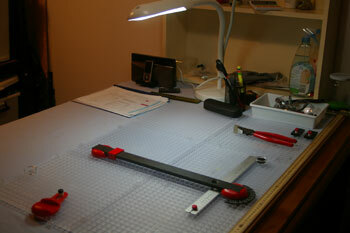 It isn’t ideal in a few areas but I am looking at building a better work bench for her. Note the fire extinguisher hanging on the wall. One thing we have tried to be very careful with is safety. Ann has procedures she follows when using the torch and other hazardous tools and materials. 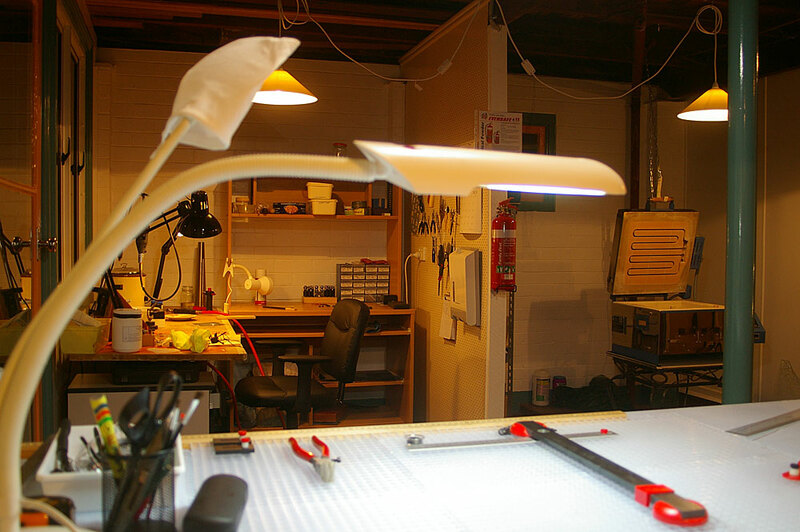 This is where we both spend time cutting glass and working on our glass creations, new ideas and sometimes scratching our heads as we work out how to do something new. I expect this area also will change a bit as we try new things, develop our skills and get more adventurous. This is just a good solid table that I have raised so it is at work bench height. Yes, that’ a radio sitting there. Working with music is fantastic. Really help with the whole experience. The cutting station is great. Allows us to cut good straight strips, angles and more. We have a circle cutter on the shelf as well as a few other tools. The lamp is okay. Could be brighter, but we can’t get any better tubes for it so that will probably changed at some pint in the future. This is our baby kiln. Well, it is probably a medium size, but certainly a baby compared to many. It is a Paragon Fusion 14 glass kiln. We sold a pottery kiln that was sitting around for a number of years and purchased this one second-hand. It is great and we are very happy with. It does have a viewing window on the left side and bead annealing doors in the front. I do think these lose a little heat, though not sure if it affects the operation. So far I have found programming the schedules a breeze, though getting the schedules right for what we are making is a little more of a problem. 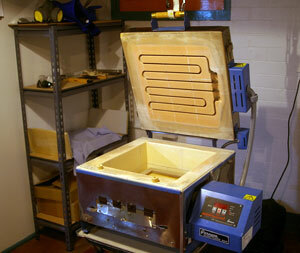 I am told the Fusion 14 is not the fastest kiln regards reaching process temperature. I can’t comment just yet as I don’t have anything to compare it to. We have had some issues with devitrification but I think that is more the glass we use – Bullseye. A supplier told me Bullseye is know for devitrifying and needs a little care. For our current needs it seems fine, though I expect that within a year I will be looking for a deeper and bigger kiln. When you start you studio you probably don’t think you will need a lot of storage, but think again. We were luck and purchased a lot of Bullseye glass from a local company at a good price, so we immediately had a storage problem. Included in the lot were many medium sized sheets of thin and 3mm glass, numerous offcuts, jars of frit and tubes of stringers. Our solution was to go and purchase bins to hold the glass and a rack system to hold the bins and other items. Problem is, the bins flex and put stress on the sheets of glass. Not a good thing. So in the works is a timber rack for the shelves to hold the glass sheets vertical and more secure. Lifting those bins in and out is a little stressful as I watch the glass flex. 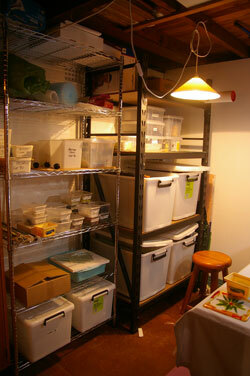 You may be able to see the many containers on the wire shelves. These hold a large amount of glass offcuts and frit (ground glass) that came with the purchase. Here is a suggestion – don’t buy wire shelving. Things don’t sit firmly and tend to rattle a little. Moving the bins in and out causes a lot of rattle over the wire shelves. I think we will be putting plywood on the wire shelves. Well, that’s about it for now. Hope this helps and keep checking back on just how our studio evolves.